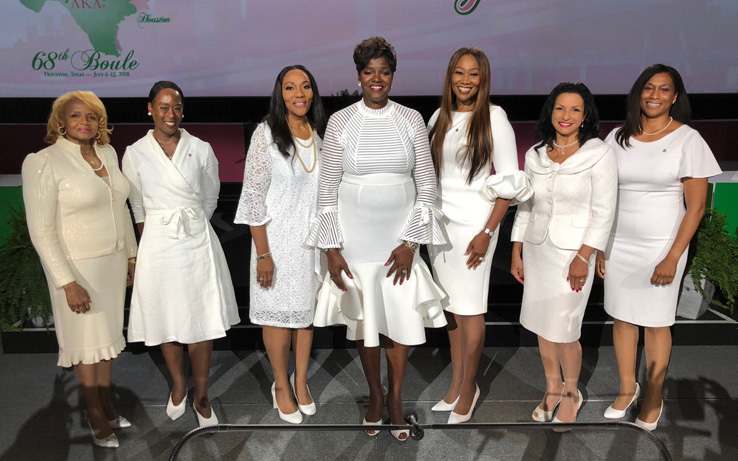 Alpha Kappa Alpha Sorority, Incorporated (AKA) recently inducted singer Yolanda Adams, diplomat Teta V. Banks, astronaut Jeanette J. Epps, activist Chantél Harris, and author Margo Lee Shetterly as honorary members. International President Dorothy Buckhanan Wilson, L.H.D. led the induction ceremony at the Sorority’s biennial conference in Houston. She noted that the Sorority, the oldest organization founded by Black college-educated women, bestows honorary membership upon women with high ethical standards who have achieved international recognition for their outstanding contributions. Ms. Yolanda Adams is a five-time Grammy award-winning artist whose music heals, encourages and inspires. She has carried the torch for contemporary gospel and inspirational music through her 13 glorious albums. The Houston native and former teacher is filled with the spirit and blessed with one of the most powerful voices in the industry. Her pioneering blend of modern gospel, R&B and a touch of jazz continues to inspire her fans and transform the musical landscape. Ms. Adams is also the host of “The Yolanda Adams Morning Show,” a fun, clean alternative morning show for people of faith. Ms. Teta V. Banks is the National Chairman of the United Nations Association of the United States of America (UNA-USA). Born in Nigeria, she is the first person of African descent to hold this position in the organization’s 70-year history. Ms. Banks leads the National Council that develops, recommends and implements programs and advocacy initiatives to address human rights issues such as human trafficking, poverty, education, environmental justice, gender equality, global health, injustice, racism and sexism. She is also a faculty member at Prairie View A&M University. Prior to joining UNA-USA, Ms. Banks served as Executive Director of the King Association for Nonviolence, in conjunction with the King Center. Dr. Jeanette J. Epps was selected in July 2009 as a member of the 20th NASA astronaut class. The New York native was a NASA Fellow during graduate school and authored several journal and conference articles describing her research. Dr. Epps worked for Ford Motor Company where she received both a provisional patent and a U.S. patent for her research. She later joined the Central Intelligence Agency (CIA) for seven years, working as a Technical Intelligence Officer before becoming an astronaut. She currently serves in the ISS Operations Branch working on issues in support of space station crews. Mrs. Chantél D. Harris is a human rights activist and the great-great granddaughter of Alpha Kappa Alpha Founder, Ethel Hedgeman Lyle. Mrs. Harris’ commitment to helping others started at a young age. Through her church she served the homeless and worked with the Circle of L.O.V.E (Let’s Overcome Violence Everywhere) program that was started by her grandmother and member of Alpha Kappa Alpha, Muriel “Puff” Lyle Smith. Mrs. Harris continues to advocate for women and children in her community. She is currently working to eliminate hostile work environments and workplace bullying. Previous honorary membership inductees include Jada Pinkett-Smith, Maya Angelou, Ntozake Shange, Alice Walker, Iyanla Vanzant, Ella Fitzgerald, Alicia Keys, Gladys Knight, Coretta Scott King, Rosa Parks, C. Delores Tucker, Suzanne de Passe, Mae Jemison, Eleanor Roosevelt, Zina Garrison and C. Vivian Stringer.